The billionaire has secured the nomination, but Republicans in Cleveland continue to grumble. But there is not a lot of joy in the GOP. Donald Trump ran s dark, dystopian campaign for the Republican presidential nomination. He peddled a politics of fear and resentment. And his Republican National Convention is proving to be every bit as harsh and unforgiving as the man a broken party has now designated as its standard bearer. And the bitterness has taken on a life of its own at its Cleveland convention. This party simply cannot get happy. Two days into its 41st national convention, the Republican Party is still struggling to determine what it is for. Not even when it is supposed to be celebrating. In speech after speech since the Cleveland convention opened on Monday, Trump backers have talked about how horrible everything is: the economy, trade policy, foreign policy, domestic policy, you name it. And the many Republicans who are not Trump backers just keep talking about how horrible Trump is. 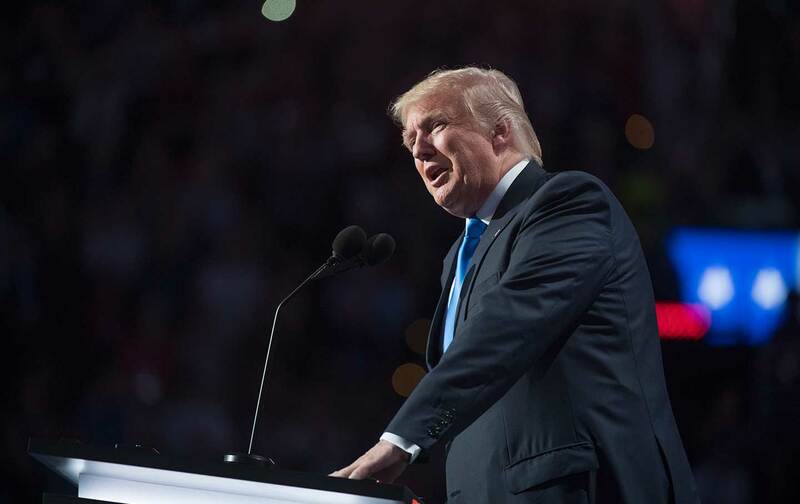 Trump arrived at the convention of a party that for months had resisted his nomination with more than enough delegates to claim that nomination. And so he has, securing 1,725 votes versus just 475 for Texas Senator Ted Cruz, whose last-ditch #NeverTrump candidacy was crushed by the voters. Another 114 delegates stuck with Florida Senator Marco Rubio, who during the primary campaign referred to Trump as a dangerous “con man.” There were 120 votes for Ohio Governor John Kasich, who has pointedly refused to attend a convention being held in his own state. Seven delegates backed Dr. Ben Carson, and Kentucky Senator Rand Paul kept two votes, while three delegates abstained—choosing no one at all over Donald Trump. And the man who began the 2016 Republican race as a favorite (at least of the pundit class), former Florida governor Jeb Bush, got just three votes from the first primary state, New Hampshire. Like Kasich, Bush was skipping the convention. As was his brother, President Bush 43, and his father, President Bush 41. Trump vanquished all his rivals—so thoroughly that several of them are actively opposing his candidacy, along with the party’s 2012 presidential nominee. And the “Party of Trump” was still vanquishing dissenters on Tuesday night. Delegates from Alaska objected to a rule that gave their votes to Trump even though they were largely for Cruz. The process ground to a halt. The band played “Shake Your Booty.” Republicans danced. The Alaska delegates were polled. Then Republican National Committee chairman Reince Priebus announced that the rules—arcane and complicated as they might be—were the rules. “In any event, have a great night,” chirped Priebus as he rejected the complaint that the candidate who said he was running against a “rigged system” seemed to be benefiting from a rigged system. The party that is meeting in Cleveland is not united in its love for Donald Trump. The Republicans who voted to nominate Trump have come to accept him as an inevitable candidate, and perhaps a useful one—in that he will be an unrelenting rival to the target of their greatest antipathy: Democrat candidate Hillary Clinton. But, for the most part, Republicans have yet to embrace Trump with the passion that parties have historically mustered for their candidates. When the roll call of the states reached Vermont Tuesday night, there was dutiful notation of the fact that the Green Mountain State was the birthplace of Calvin Coolidge—a Republican who was nominated by the party at a convention in Cleveland and went on to win the presidency. The obvious suggestion was that the Republican who was nominated in Cleveland on Tuesday would be similarly successful in his quest for the nation’s top job. Trump got no howling parade of celebration. “New York, New York” boomed through the speaker system. And people cheered. For a few minutes. Even when the roll call was complete and House Speaker Paul Ryan announced that “Donald J. Trump has been selected as the Republican nominee for president of the United States,” only a few more minutes were expended on celebration before a parade of politicians and Trump business associates and family members began the nightly ritual of blaming Hillary Clinton for everything but the muggy weather. Condemning Hillary Clinton comes easy for Republican delegates who delight in suggesting that presumptive Democratic nominee should be jailed. Embracing Donald Trump has not come so easily. And that’s a problem for a Grand Old Party that knows what it is against but—two days into its 41st national convention—is still struggling to determine what it is for.